Behind the mighty eighteenth-century wall of the oldest enclosed convent in Poland - Benedictine convent in Staniatki, near Krakow - the life of twelve nuns in their 70s goes on. Despite their age and the world of rapid change, they try to comply with the rule set over ten centuries ago ‘ORA et LABORA’ each day. Our protagonists – nuns Anuncjata and Benedykta (40 years in convent) – introduce us to the world behind the wall telling us about their lives and decisions in a specific way. 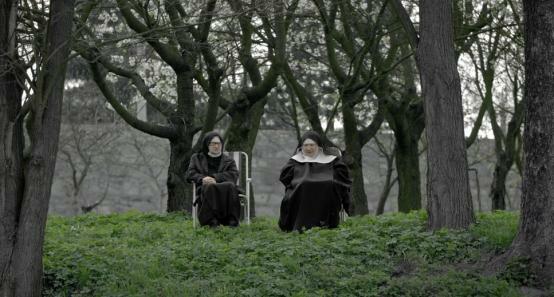 They show us the world of convent in true colours, without stereotypes, often touching and amusing at the same time. This is the film about silence said aloud. Michał Hytroś was born in 1994 in Krakow. He studies directing at The Polish National Film, Television and Theatre School in Lodz and acting at The Aleksander Zelwerowicz National Academy of Dramatic Art in Warsaw.